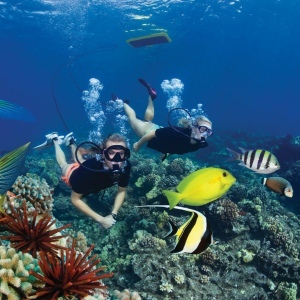 The Kanaio Coast Tour offers an opportunity to explore a rarely seen part of Maui, the volcanic Kanaio Coast and a variety of exotic snorkeling sites, including both spinner dolphin and green sea turtle habitats. Snorkel remote coves, pinnacles and bays experienced by few and inaccessible by car. Sightsee the crystalline volcanic formations of Mail's most recent lava flows. Trip includes snorkeling at dolphin and turtle habitats, lunch, beverages and snorkel gear. The Kanaio tour has a fruit and beverage break between sightseeing and snorkeling. Lunch is served deli style, consisting of turkey and roast beef, veggies & dip, cheddar and Swiss cheeses, whole wheat buns, and condiments with a delicious homemade style chocolate chip cookie. Beverages are Hawaiian fruit juices and bottled water. Departing La Perouse Bay, we make one more stop in Makena where we serve a delicious buffet lunch and snorkel with sea turtles and spotted eagle rays near pristine lava fingers. These turtles, although endangered and protected, are accustomed to seeing snorkelers and do not mind being photographed as they surface for air just a few feet away.